The tenth of October 2010. 101010. The day that maths geeks get really excited. 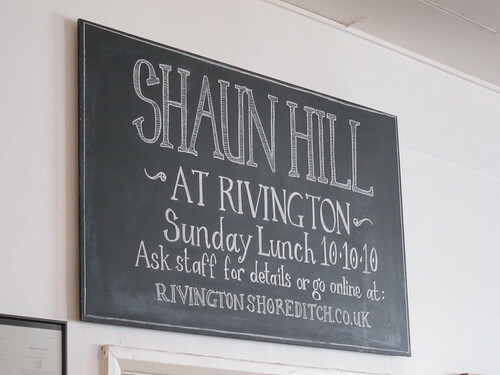 It was also the day that I got quite excited as it was the day I got to eat at the Rivington Grill, with Shaun Hill (of the Walnut Tree, Abergavenny) in the kitchen. The London Restaurant Festival (this year, in association with AMEX) comes but once a year, with new and exciting events each year to commemorate it. You may have seen a giveaway for tickets to the Big Quiz a few weeks ago on this blog, but one of the big events for this year was 10-10-10, ten different chefs from outside of London, working alongside ten chefs from within London, all on the 10th of October. 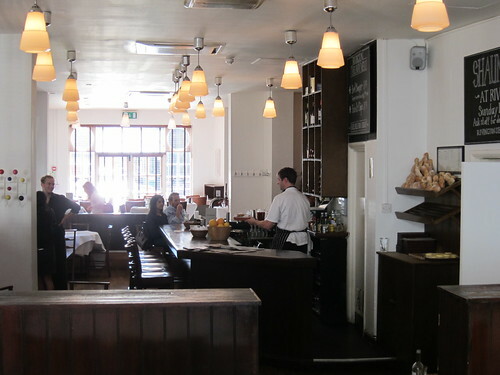 As part of the London Restaurant Festivals 10 “bloggers” that they were working with, I was invited down to the Rivington Grill where Shaun Hill of the Walnut Tree in Abergavenny was taking up residence for one night only. I really didn’t know that much about Shaun and his work, but a little research revealed that he has had a Michelin star for over 20 years and favours a more rustic approach to his food. A few more feelers revealed that some who had eaten at the Walnut Tree had often found it the highlight of their trip to the Abergavenny festival. All pretty good news. I was regaling all this new found information with my dining companion, but unfortunately she was far from interested. 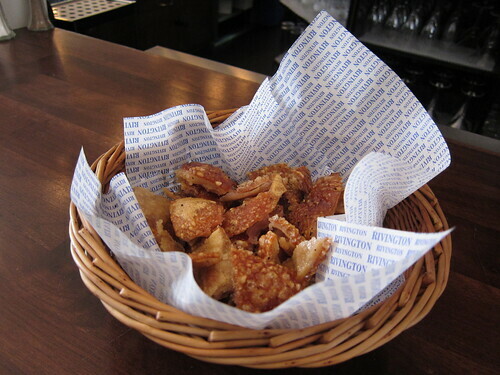 Instead, her attention was drawn to the bowls of warm salty and perfectly crisp pork crackling placed evenly across the bar. We slowly stuffed our faces with this most satisfying of “amuse bouche” and I actually had to restrain myself from eating more, a task I never knew I was actually capable of. 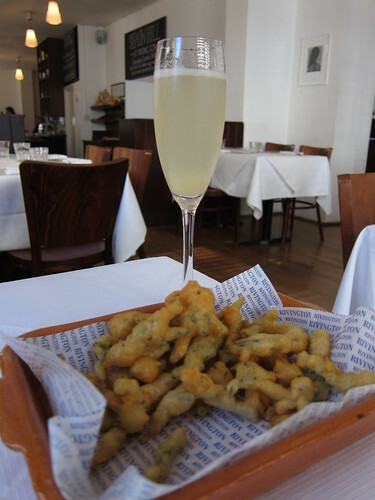 As we sat down with our pear and elderflower Bellini’s, we were given a basket of battered samphire. Battered in a fluffy, yet crispy beer based batter, the samphire delivered nuggets of salty bursts. Another incredibly addictive pre meal snack, even though the flavour of the samphire was lost a little, the batter was greaseless and delicious. Given a few options over three courses, my companion opted for a sweetcorn soup with squid, a dish I had considered owing to my obsession with all things sweetcorn, although the burrata with Tuscan bread salad was equally so. A quick chat later and it was decided. The sweetcorn soup was perfectly acceptable although I found the fishiness dominate the subtle flavour of the sweetcorn. The burrata was unbelievably creamy. Similar to a mozzarella, although made with cream, it mingled with the vegetables and olive oil to almost become a dressing. 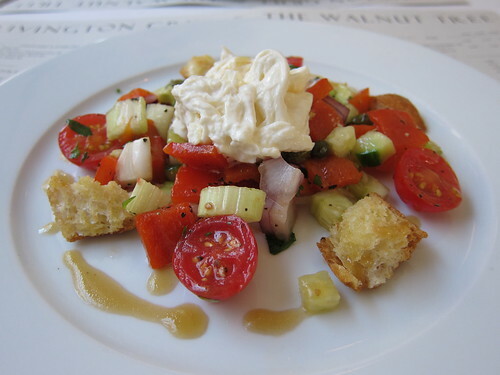 Expecting something more similar to a panzanella, the bread was fried into croutons, although I am rather fond of croutons so still went down well. All the flavours formed an enjoyable salad, although I found the huge chunks of raw onion lazy and actually quite hard to digest. I ended up taking them out. With fish being one of the options for a main (albeit served with sweet clams, which I seem to have developed a bit of a crush on of late) and hare the other (never been the biggest fan of hare), I opted for the Welsh lamb with ragout of Autumn vegetables and ceps, an interesting combination, and a dish I was really looking forward to. 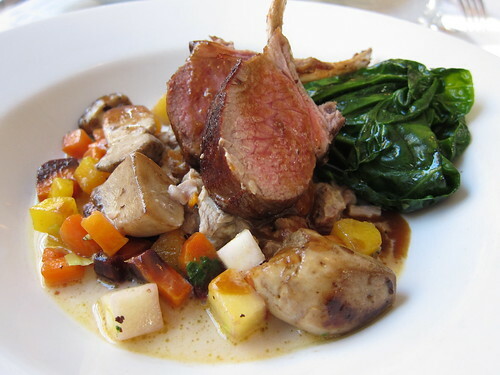 The lamb arrived as two perfectly pink cutlets sat on a bed of delicately fricasseed shreds of lamb and a ragout of turnips, squash, carrots and potatoes. The shreds of lamb were cooked in a delicate cream and wine sauce, with the ample ceps acting as sponges, soaking up all the sauce. For some reason, there were huge undercooked leaves also on the plate, which seemed totally out of place, and were left largely untouched. The combination of all the elements to this dish (sans greens) went really well together and I looked sadly at my plate as it lay empty. Desserts were uncomplicated but elegant. The mountainous orange and almond cake was delicate and light, despite appearing quite a task to finish when it first arrived. 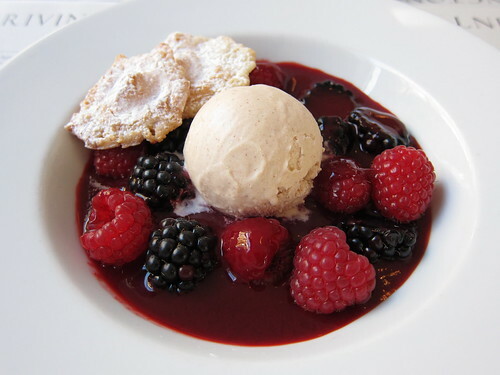 My choice of autumn berry soup with cinnamon ice cream was light and tasted more of Christmas than autumn. The lightly spiced soup was thick and rich with raspberries and blackberries, a fresh ending to a good meal. Although there were a few issues with some of the dishes (huge chunks of onion, errant pieces of unnecessary under cooked greens), I rather enjoyed my taste of Wales. It was clear that there was some very good cooking going on in the kitchen and was pleased that an event like the London Restaurant Festival had introduced me to a well established chef from outside of London. For someone who has lived in London for over 10 years now, I often forget that there is more to life than the big smoke and rarely venture outside of the M25. I really need to change that. I really wanted ot go to some of these, but never got my arse in gear. Everything looks so good, but as you say somethings just spoilt a good dish. Large raw pieces of onion are never welcome in any dish. As I've never ate at the Rivington Grill, how different was the food on that day to what they normally serve? Where are you going for 20.10.2010? Samphire tempura. Genius. Will have to try that next summer. The berry dessert looks divine as well.